Get your weekend off to a great start and benefit your Tango as well! Venue information about the Cross Barn here. Combining the best of a Práctica and a Milonga, our Odiham Práctilongas are friendly, informal and fun. 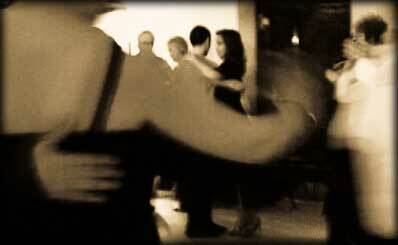 Becoming an experienced Tango dancer includes making the transition from dancing at classes to dancing socially. Milongas can be a bit of a challenge at first, and our Práctilongas are an enjoyable half way house between classes and a full blown Milonga. Our Bell House Practilonga is even more informal – ideal for your first social dancing outside the structure of classes. Venue information about the Bell House here. We aim to appeal to a wide range of dancers with good venues, a friendly atmosphere and the best music, so you can just dance, practise, catch up with your tango friends, or even get some coaching if you wish. Plus our usual complimentary light refreshments. We foster a positive and encouraging atmosphere to build dancers’ confidence, with no blame or criticism – we can all feel a bit vulnerable when learning something new, so it is vital that people feel comfortable and supported. We also discourage more experienced dancers from teaching ‘their favourite moves’ to recent beginners – in our experience this is rarely helpful and often causes confusion. If you do need any help, we are available throughout the evening. Our bodies only become familiar with new movements through repetition. Tango can be challenging – especially at first – and there is no substitute for regular practice. If you want to make real progress, you have to consider dancing more than one class once a week. However, what you practise, and how you do it, makes a huge difference. Your body learns exactly what it does repeatedly – no more, no less. It usually takes longer to get something into your muscle memory than into your brain, but once it’s there, it tends to stick. So better to get into good habits rather than bad ones. Developing a sound technique is the foundation of becoming a good dancer, so practising in a supportive environment with good coaching available in the background makes a lot of sense. The old saying goes ‘practice makes perfect.’ Well, unfortunately it doesn’t . . . but practice does make permanent! Please note: The purpose of our Práctilongas is to provide dancers with an opportunity to dance in the Salon style of Argentine Tango, with due regard for your partner and respect for other couples through considerate floorcraft. They are not “Freestyle” evenings where anything goes. If your preferred dancing style involves ostentatious show tango / fusion moves, including excessive movement around the floor, extravagant decorations, kicks, lifts and similar extreme moves, please be aware that our events are not suitable for you. If you are not sure what we mean by “Salon style” check out the clips on our Tango video page. The Práctica is a time honoured tradition in the learning of Tango in Argentina. In its original form, young men who wanted to learn how to dance well would attend all male prácticas to perfect their technique by dancing with other men. After months of learning the follower’s steps they would finally be allowed start to learn how to lead. In this way they already had a good idea of what it was they were leading! By the time they attended their first Milongas they would have mastered both leader and follower roles and were well and truly ready. Given the shortage of women in Argentina at the time, being a good dancer was a young man’s best chance of meeting women and finding a girlfriend – so motivation was high! Nowadays we have to find a shorter route. Our classes are designed to help you learn as quickly and effectively as possible. From then on, it’s a question of practice, to get posture and movement into your muscle memory so that you can dance naturally without having to think about it.